Strong drag occurs in dense atmospheres, and satellites with perigees below -120 km have such short lifetimes that their orbits have no practical importance. Above -600 km, on the other hand, drag is so weak that orbits usually last more than the satellites' operational lifetimes. At this altitude, perturbations in orbital period are so slight that we can easily account for them without accurate knowledge of the atmospheric density. At intermediate altitudes, roughly two variable energy sources cause large variations in atmospheric density and generate orbital perturbations. These variations can be predicted with two empirical models: the Mass Spectrometer Incoherent Scatter (MSIS) and the Jacchia models [Hedin, 1986; Jacchia, 1977]. Altitudes between 120 and 600 km are within the Earth's thermosphere, the region above 90 km where the absorption of extreme ultraviolet radiation from the Sun results in a very rapid increase in temperature with altitude. At -200-250 km, this temperature approaches a limiting value, called the exospheric temperature, the average values of which range between -600 and 1,200 K over a typical solar cycle. The thermosphere may also be strongly heated from geomagnetic activity, which transfers energy from the magnetosphere and ionosphere. Heating of the thermosphere increases atmospheric density because the thermosphere's expansion causes increased pressure at fixed altitudes. Heating due to extreme ultraviolet radiation and its solar cycle variation has the greatest effect on satellite lifetimes. Geomagnetic disturbances are generally too brief to significantly affect lifetimes. Extreme ultraviolet radiation from the Sun is completely absorbed before it reaches the ground and is not measured routinely by satellite-bome instruments; consequently, its effects are unpredictable. Solar activity is monitored using such proxy indices as sunspot number and the F10.7 index which was previously discussed. Figures 8-1 to 8-4 provide a means of estimating satellite lifetimes based on the information available to the mission designer. Figure 8-2 provides the atmospheric density as a function of altitude corresponding to various values of the F10.7 index. Densities were obtained from the MSIS atmospheric model [Hedin, 1986]. Below about 150 km, the density is not strongly affected by solar activity. However, at satellite altitudes in the range of 500 to 800 km, the density variations between solar maximum and solar minimum are approximately 2 orders of magnitude. 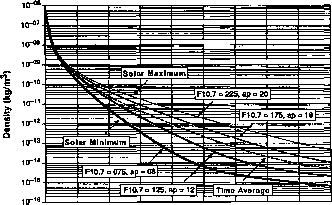 The large variations in density imply that satellites will decay more rapidly during periods of solar maxima and much more slowly during solar minima. This is clearly demonstrated in Fig. 8-3 which shows the altitude as a function of date for a set of 9 hypothetical satellites launched over a 6-year period. 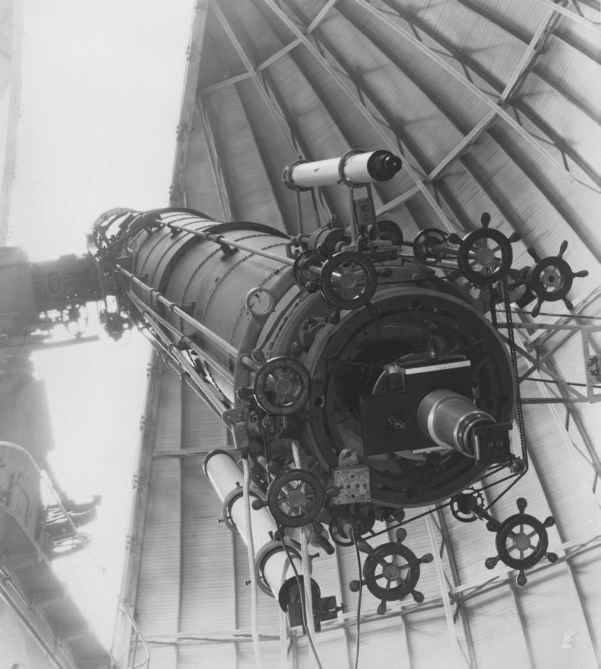 We assume that all of the satellites were launched in a perfectly circular orbit at 700 km altitude—3 in 1956 at the beginning of a solar maximum, 3 in 1959 toward the end of the solar maximum, and 3 in 1962 near the time of solar minimum. In each group one satellite had a ballistic coefficient of 20 kg/m2, one was at 65 kg/m2, and one at 200 kg/m2. The histories of the 9 satellites are shown in the graph. Fig. 8-2. Density vs. Altitude for Various F10.7 Values. Note that the curves have the same shape as the altitude maintenance curves in Rg. 7-8.